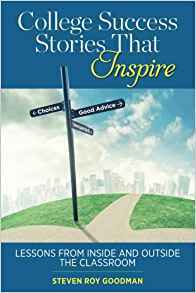 Steven Roy Goodman is the author of the new book College Success Stories That Inspire: Lessons from Inside and Outside the Classroom. 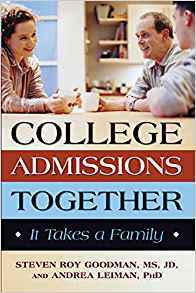 An expert on college and graduate school admissions, he also has written the book College Admissions Together: It Takes a Family, and he hosts the TV talk show Higher Education Today. I was surprised by how many people wanted to relate personal stories at public venues--I’m at a wedding, on a train, people want to tell me about college-related things that happened to them. The more that happened, I thought I should try to collect them. Q: Who do you see as the book’s readership, and what are some of the main things you hope they take away from it? A: There are a couple of groups of readers. For students and prospective students, that’s the major group—you can have a powerful experience at any number of colleges. It would be great if everybody could go to Harvard on a full scholarship, but that’s unlikely to happen. There should be places people go and be successful whatever they go. Harvard is an excellent school, there are a number of people from Harvard in the book, but there are people from all sorts of universities who had powerful stories. Q: How did you decide on the order of the stories in the book? A: There were two issues of order—the order of the chapters and the order of people within the chapters. The order of the chapters themselves, the publisher and I came up with that together. A leads to B, which leads to C.
The order within the chapters was a little bit more difficult than it appeared. A few people wanted to remain anonymous. I gave people the option of having their name in and being anonymous. There were four ultimately who were anonymous. We knew they had to not be at the front of each chapter. It was a little bit like a jigsaw puzzle. I wanted the first story to be the most compelling. Then we had the issue of people who wanted to remain anonymous. Then came the issue of how one story flowed into the next, and what the connections were. We had a bunch of New York-Philadelphia examples that flowed together well. I also wanted examples that showed a relationship to one another—we had two marching band stories. Also, certain people were more serious than others and I thought it was important to mix that up. Q: What about the first story in the book, about the Columbia University student who was accepted to clown college? Why did you start there? A: I think this story captures the essence of the book—here we are talking about a very successful businessperson who went to Columbia College, one of the most rigorous schools in the country. In my mind, that’s a powerful visual—here’s a student accepted to clown college because he’s an expert juggler. 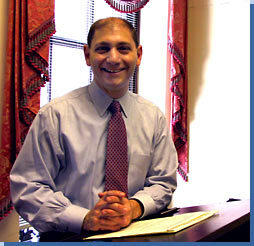 He is an excellent juggler, and happened to be a graduate of Columbia. Q: What are you working on now? Are you writing another book? A: This one just came out. Probably I’ll write another one, but right now I’m focused on this. My hunch is that this issue of memory, college memories, is not going away. It intrigues me even more now. It’s such a powerful thing. The woman from Alabama toward the end of the book, and the woman from Iowa both talked about memories of football weekends. Their memory of this is so important that they still wanted to talk about it. In contrast to the marching band people, who were marching in X degrees, these two people really grabbed the idea of memory as something you can grab in any way. You can be just a regular person, not a juggler or a band member, but it’s still a very powerful experience. A: There are two other audiences for the book. One, parents of students, to see that just because you had a particular experience at a particular college doesn’t mean your son or daughter couldn’t have a powerful experience at a different college in a different way. Also, your age, give or take four years, is a different college generation. I hope this book demonstrates that there’s nothing particularly unique about the class of 2014. 2014 had a powerful experience just as the class of 2004 did. I think the key issue is the memory, not the number. The memory is the powerful thing.